In a public meeting at Piyong, the Governor said nation will develop, when the last person in the queue is taken care of. The Governor of Arunachal Pradesh Brig. (Dr.) B.D. Mishra (Retd.) visited the various projects, undertaken under the ‘Aspirational District’ programme in Namsai District on 11th September 2018. The Governor visited Health & Wellness Centre, Piyong and interacted with beneficiaries of Pradhan Mantri Awas Yojana, Saubhagya Scheme / Pradhan Mantri Sahaj Bijli Har Ghar Yojana and Pradhan Mantri Ujjwala Yojana. 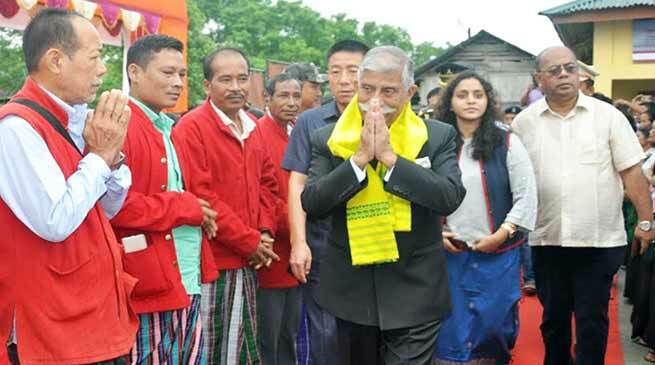 The Governor also visited the residence of Monisor Payeng in Adi Ningroo Village, who have availed benefits from Pradhan Mantri Awas Yojana, Saubhagya Scheme and Pradhan Mantri Ujjwala Yojana. Monisor and his wife Deepa expressed their gratitude to the State and Central Governments for material assistance, which has changed their lifestyle for better. The Governor also visited the Anganwadi Centre and Government Upper Primary school at Piyong which are cover under the Aspirational District programme and interacted with Anganwadi workers, ASHAs, students and teachers. They enquired about the nutrition provided to them, mid-day meals and status of textbooks and advised the children to study hard, be obedient to their parents and teachers and keep themselves healthy. Addressing a public meeting at Piyong, the Governor said nation will develop, when the last person in the queue is taken care of. Therefore, the government and administration should see that every needy person is taken care of and that will to achieve the overall development. It is the vision and mission of Prime Minister Narendra Modi and Chief Minister Pema Khandu to see every part of this Frontier State develops, he said . Hence, it is the onerous responsibility of every citizen to ensure that projects are implemented with honesty, transparency, accountability and continuity. This trend must take root in the State, the Governor pointed. Earlier, the Governor honoured the eldest Gaon Burah Lohani Mantaw, GB, Piyong Khampi and gave away the cheques to beneficiaries under Krishi Vigyan programme for promoting organic farming. While citing reference of Tapi Gao, Director, Elementary Education, who has adopted Govt. Primary School, Raj Bhavan, the Governor advised the Heads of Department and officers to adopt a school each to improve the education status of the State.